Carol Kidd retired from the Maryland Public Schools after teaching French for 36 years in Prince George’s County. Retirement gave Carol the time to devote to art. 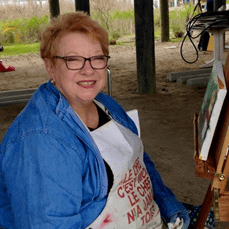 She paints in oils, her favorite topics being landscapes inspired and influenced by her travels to Tuscany, Provence the beaches and marshes of Coastal North Carolina. Since coming to St. James, Carol has learned how to paint on glass surfaces, creating delicate motifs such as grape vines, flip flops, whole gardens of flowers and golf scenes. She also does custom work, having replicated wedding invitations and other themes of weddings, bridal showers and special events on wine glasses and champagne flutes. About two years ago Carol began painting designs on silk scarves. Some of these designs include cats, fish, falling leaves, flowers and shamrocks. But her favorite designs are those that are free, allowing Carol to flow colors together and then treat them with salt and sugar. It’s such fun watching the designs emerge as the dyes dry on the silk.